LOCATION: Dewey Avenue in eastern Old Ocean Springs, Claim Section 37, T7S-R8W, Jackson County, Mississippi. DIRECTIONS: From the intersection of Bienville Boulevard (US 90) and Washington Avenue at Ocean Springs, go south (left) at Washington for .30 miles to Porter Avenue. At Porter turn left (east) and go one block to Dewey Avenue (see Ocean Springs City Hall on the SW corner of Dewey and Porter). Go right (South) at Dewey for .20 miles to the Bellande Cemetery on the right (West). HISTORY: Bellande Cemetery is named for Joseph Bellande (1813-1907), a French immigrant seaman, who settled in Ocean Springs in 1835. He had come from Marseille where his family were caulkers in a local shipyard. As a result of his marriage to Roseline LaFauce (LaForce) (1821-1893), a heir of the Catherine Bourgeois (1768-circa 1845), the Widow LaFontaine, he received title to about 20 acres of land from the front beach on the Bay of Biloxi to County Road (Government Street). Today, City Hall, the Public Library, Police Station, a part of Children's Park, Bellande Avenue, Dewey Avenue, and the cemetery are located on this land. Joseph Bellande made his livelihood as a fisherman and sailor. He was the father of eleven children. C.E. Schmidt, the noted Ocean Springs historian and author, thought that this cemetery is the oldest in Ocean Springs. 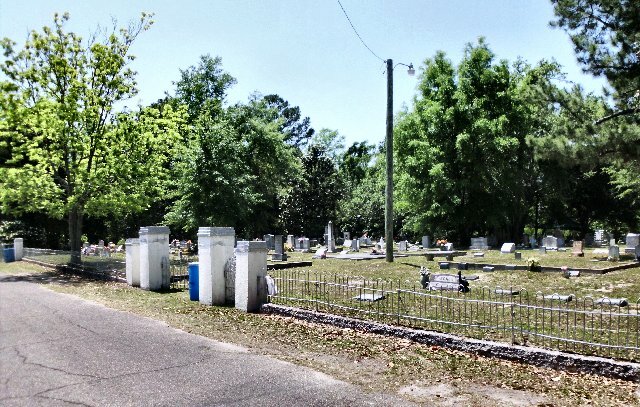 He suspected that the Bellande Cemetery commenced as a family burial plot for the LaFontaine Family and then became a neighborhood cemetery for many of the early Ocean Springs families: Ryan, Beaugez, Seymour, Ladnier, Catchot, Bellman, Westbrook, Benezue, Mathieu, and Cox. The original size of the Bellande cemetery was .77 acres (168 feet x 200 feet). With the purchase of .28 acres (80 feet x 155 feet) from Rita K. Holloway on March 5, 1976, the city expanded the size of the cemetery to its present size of 1.05 acres. In the original Bellande Cemetery, no grave lots had ever been sold. The descendants of the old families took grave sits as they were needed. The City of Ocean Springs, after the Holloway purchase in 1976, sold lots in the southern addition until recently. According to City Clerk, Sandra Jenkins, all cemetery lots are sold. Armina Ladner Cox 11-8-1869 to ? Marie Castellin Bosarge Mon Ryan 1824 to ? Pauline Beaugez Tiblier 1846 to -? Ray L. Bellande, The Bellande Cemetery, A History and Register (1851-1990), (Ray L. Bellande: Ocean Springs, Mississippi - 1990). C.E. Schmidt, Ocean Springs French Beachhead, (Lewis Printing Services: Pascagoula - 1972), p. 83. Mississippi Coast History and Genealogical Society Journal, "The Bellande Cemetery", Volume 19, No. 1 (February 1983), pp. 28-33. The Ocean Springs Record, "Dewey Avenue Cemetery is Bellande", August 6, 1970, p. 6.